Alejandro Aranda has been wowing them on “American Idol” since March 6. 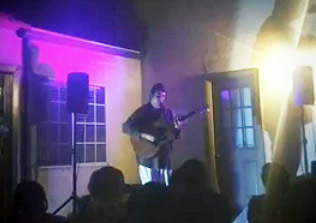 He says he’s a dishwasher from Pomona, a description that, combined with his humble manner and way with an acoustic ballad, have made him a sensation. I delve into his recent past as an open mic and street performer in Pomona and Claremont in Sunday’s column. Photo from March 30 Pomona appearance by Liliana Pardo. I had seen the interior at one point during the construction and was impressed at all the effort being expended. 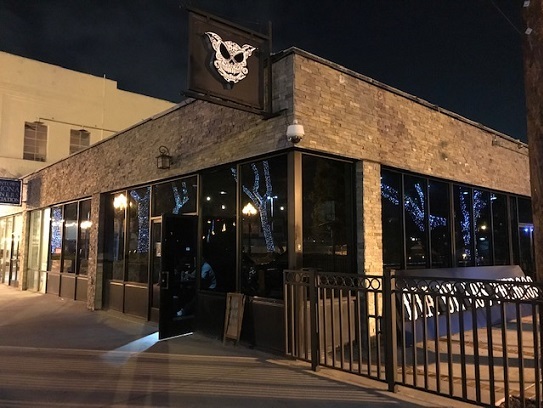 The brick building is three stories tall, with a basement tavern, a restaurant and bar on the main floor and an events center on the top two floors for wedding receptions, private parties and such. I had never eaten at Metro until a few weeks ago. A friend and I were meeting for lunch on a Monday at the Rookery, which turned out to be closed Mondays; ditto with Dia de los Puercos, the next restaurant as we walked east on 2nd Street. After crossing the street, we saw Metro Ale House and figured, why not? We sat near the bar, ordered water and perused the menu. 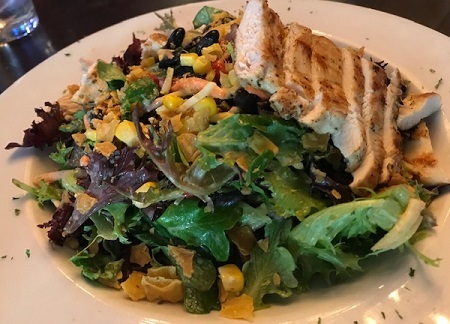 It has appetizers (and many more than is typical, probably since they make for good bar food), salads, sandwiches, tacos, pastas, seafood, steaks and chicken. As you might suspect from the wide-ranging menu, there’s something for everyone, but probably not the best versions of anything. 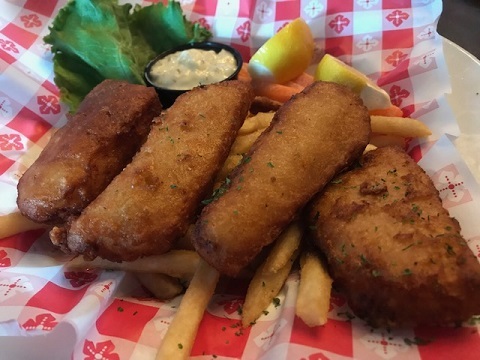 I got the fish and chips ($12), cod fillets in a Guinness batter with seasoned fries. These were acceptable, if not as good as at O’Donovan’s a block away. On my way back from the men’s room, I saw a number of well-dressed folks taking the stairs up to an upper floor for a post-funeral luncheon. And there were a fair number of customers on the main floor where we were. 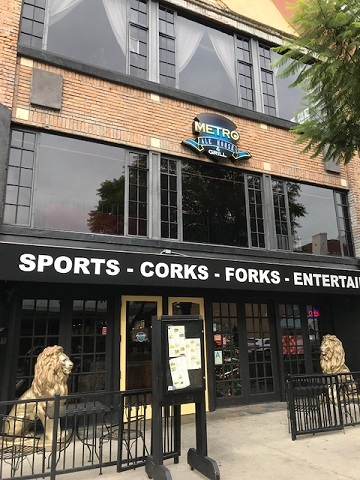 Metro Ale House likely fills a need, especially on weekends and as an event space, or as a bar. It gets 4 stars on Yelp, for whatever that’s worth, but I wasn’t enthusiastic about the place, at least as a lunch spot. Had my friend and I kept walking east, we would have found Slummin’ Gourmet, which would have been a more satisfying choice. 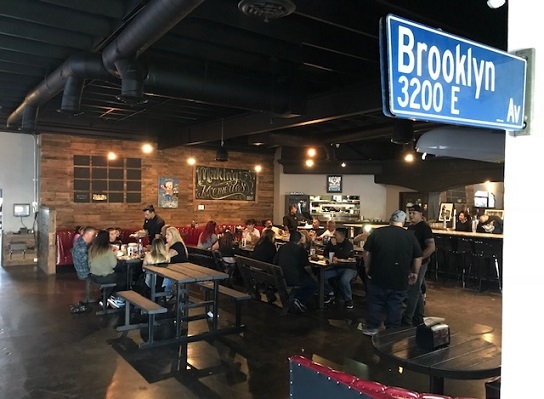 There’s a trend in LA of food truck operators opening traditional restaurants, and like a lot of LA trends (concert venues in old theaters, Instagram-worthy breweries, homelessness), this one has likewise come to Pomona. Slummin’ Gourmet‘s truck used to come to the Fairplex Food Truck Thursday event, so it’s not a stranger to town. 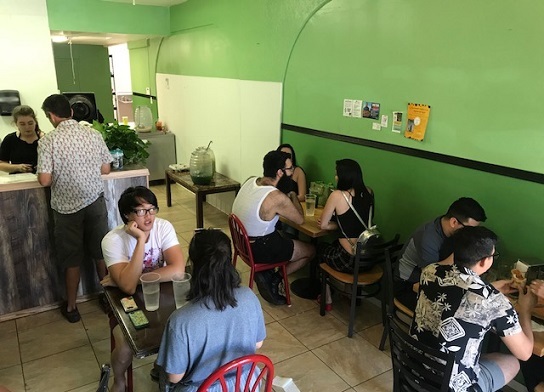 Last October, chef Tony Lu retired the truck, except for catering or special events, and opened his restaurant in a narrow storefront in downtown Pomona’s Antique Row. For you oldtimers, it occupies what used to be Kaiser Bill’s Military Emporium. After weeks in which I waited patiently for a friend to be in town at lunchtime, she threw me over for another lunch partner. I see how it is. 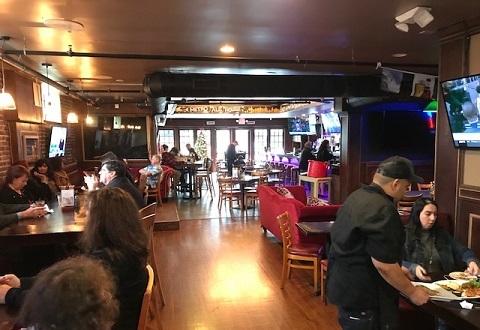 So when two other friends wanted to meet up for lunch in Pomona, Slummin’ was among my suggestions and that’s where they picked after a look at the intriguing menu. Antique Row, once lined with antique stores, now is about half vacant, another line of work, like newspapering, on which the internet has taken a toll. Squeezed between a salon school and a vacant antique mart, Slummin’ is joltingly modern from its design aesthetic to its inventive fusion of Asian and American tastes. We lined up at the counter and ordered a bunch of items to share: chipotle maple sweet potato tots ($5), Chicken Done Right sandwich ($12), honey walnut shrimp “tacos” ($14), P-Town Seoul Bowl ($14), Asian BBQ pork belly baos ($9), and cauliflower curry grain bowl ($11). 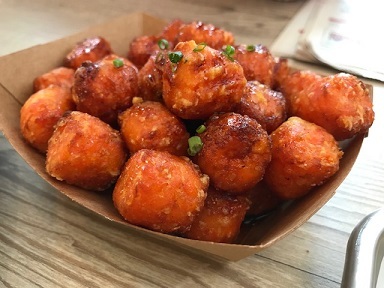 The tots, dusted with sesame seeds and scallions, were fun, only lightly spicy and both tastier and moister than sweet potato fries tend to be. 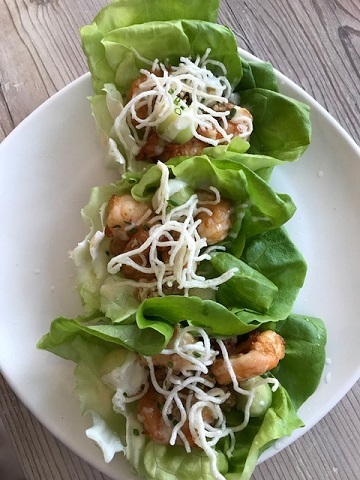 The honey walnut shrimp “tacos” are served in Bibb lettuce wraps rather than tortillas, befitting their Chinese, or at least Chinese American, origins. The lettuce held together surprisingly well, and the combination of lightly fried shrimp, sauce, cucumber, lettuce and crispy white vermicelli was delicious. Two of us said this was our favorite. 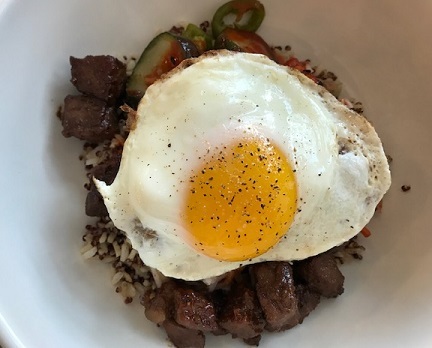 The Seoul bowl, with rice, pork belly, kim chi and a fried egg, was another favorite. We also liked the pork belly baos, which came open-faced like tacos. We were less impressed by the grain bowl, where the curry and the quinoa didn’t appear on speaking terms. The Chicken Done Right sandwich, despite a nice Asian slaw, didn’t have enough crunch or spice. Chicken Almost Done Right would have been more accurate. “It’s just not memorable,” one in our party said. We also topped things off with two churros ($3.50 each), which didn’t appear to have been made onsite and which were too sugary. Still, we were impressed by the eclectic menu, which changes every week. In fact, looking at the menu online as I write this on Tuesday, not a single item we ordered — and we ordered a lot — is on this week’s menu. 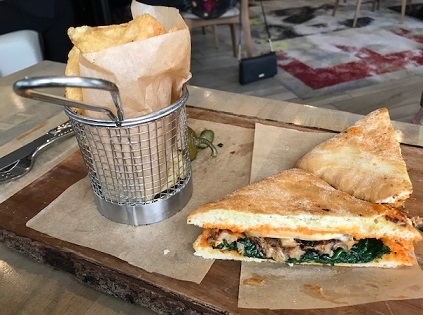 More important, then, is the general impression: It’s a clean, lively spot, the staff is really nice and they’re turning out some quality items. “They have that food-truck pedigree where they’re used to pumping things out,” one friend said admiringly. You won’t feel like you’re slumming by eating here. Slummin’ Gourmet elevates the Pomona dining scene. 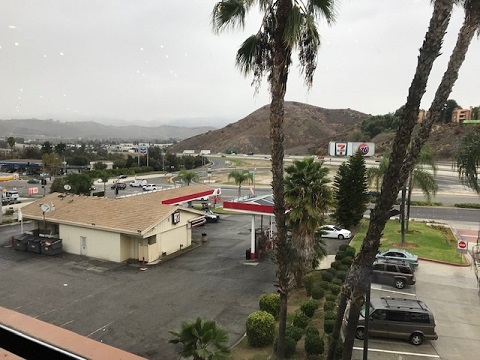 For many years the off-ramp from the 57 Freeway at Temple Avenue was notable for only one thing: It was home to the Inland Valley’s only Wendy’s. (The chain had evidently contracted; it’s since expanded again.) 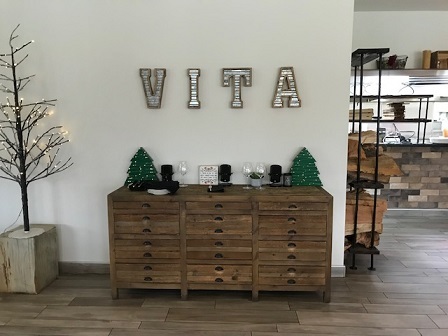 But since last March it’s also been home to a newly renovated DoubleTree, and also Vita, an ambitious hotel restaurant. It’s mildly challenging to access. Basically, you use the driveway for Wendy’s, then take the fishhook driveway up and around to the restaurant entrance. It’s modern Italian, served in an airy, stylish space with repurposed wood, brick and metal. That’s meant to reflect our rustic heritage but basically just reflects contemporary design. 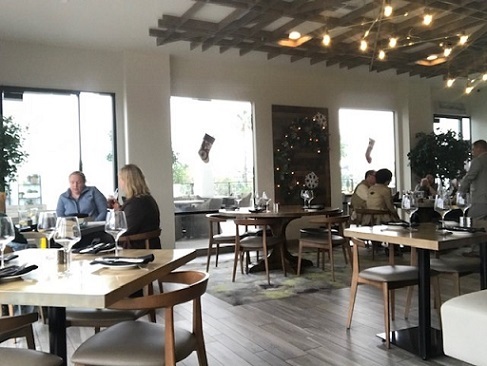 There’s expansive indoor seating and a large patio, which for obvious reasons wasn’t in use on the blustery December afternoon a friend and I visited. The menu has small plates, soups, sandwiches, salads, pastas, pizza and dinner entrees ($32-$48) like cioppino, pork chop and N.Y. steak. (You can also get, to quote the menu, a “spice rubbed baby lamb.” I’m picturing it being led to my table, where my party would ruffle its wool, lick the spices from our fingers and then send it bounding back to its mother.) There’s a full bar, happy hour and wine. 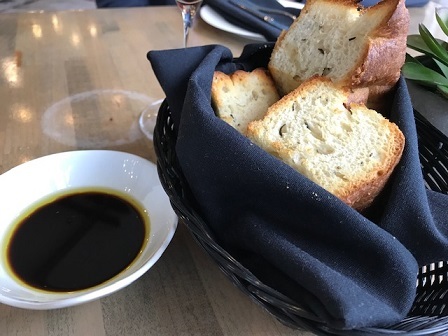 Complimentary rosemary ciabatta bread was served with olive oil. My friend got the roasted porchetta sandwich ($17), with pork, spinach, smoked cheese from Pomona’s Di Stefano and chili aioli on a Tuscan roll. He called it the best sandwich he’d had in some time. It came with a basket of housemade potato chips. 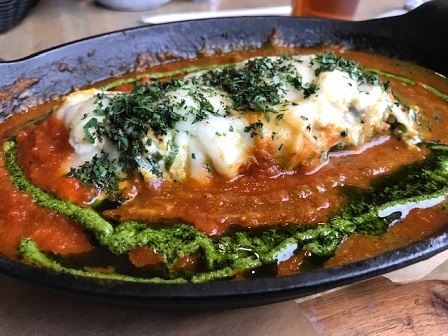 Knowing that Vita sources its produce from Cal Poly Pomona’s farm, I ordered the farmers market vegetable lasagna ($18), with housemade pasta, local cheeses and (ooh-la-la) vodka sauce. Lasagnas come in all forms, and this one, rather than the usual cake-like layered block, was more horizontal, heavy on the sauce and cheese. The taste was fine, and there were vegetables amid the sauce, zucchini most recognizably, but the dish wasn’t as vegetable-intensive as I had hoped for. Service was welcoming, attentive and not overbearing. We were seated by a window, which provided natural light. The scenery below us left a little to be desired. “There’s a view of three gas stations,” my friend remarked dryly. There were, I suppose, the promised “sweeping views of the San Gabriel Mountains,” but with a lot of clutter in the foreground. That’s hardly Vita’s fault. The patio views of the San Jose Hills to the west are probably more inspiring. 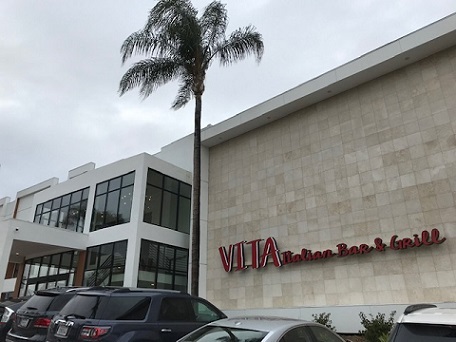 Vita — it’s pronounced vee-tah, by the way — is one of our valley’s better dining experiences and well worth a visit. It’s almost too good for us. I only wish the restaurant’s website were seemingly less embarrassed by its location. Taking a broad view of things, the website is vitalosangeles.com, and you have to go to the Contact Us page to learn the city and address. Pomona has a lot of Mexican restaurants, most of them taquerias, but places taking a more chef-driven approach are rare. 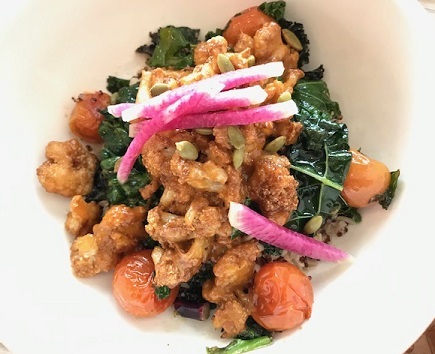 There’s been some movement in that regard in the past year with the vegan Mexican spot Borreguitas, the cholo-friendly Dia de los Puercos and the modern Mexican Corazon Urban Kitchen. Among the experimental restaurant’s experiments was where to locate. 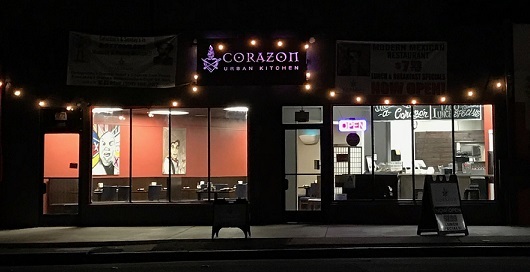 Corazon opened on East Second Street earlier this year, was raved about and then within weeks closed in a landlord-tenant dispute. This summer it surfaced on Garey Avenue above the 10 Freeway between a tire shop and a liquor store across from Pomona Valley Hospital Medical Center. I had lunch there recently with a friend who’d eaten there once before. A window seat will put you practically on the sidewalk. Parking is either on the street or in the lot immediately to the south, which the server assured me was fine. The exterior is a muted red with a stylish metal sign, the effect somewhat offset by a banner or two. 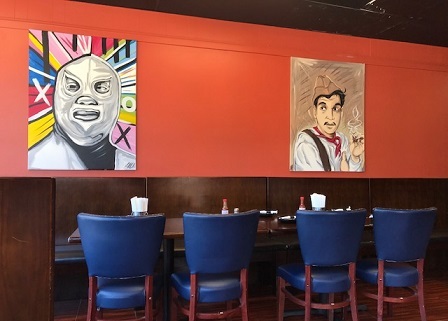 The interior is inviting with faux wood flooring, pumpkin-colored walls and portraits of such Mexican icons as Frida, Cantinflas and El Santo. Lunch started with chips and salsa. 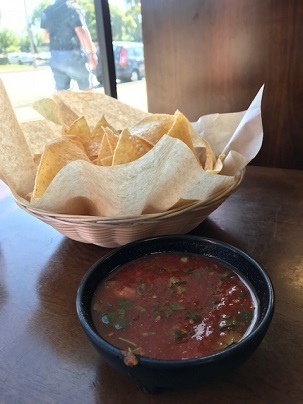 The chips were warm, the salsa fresh tasting. My friend and I ordered from the lunch specials, which are $8. I got a carnitas sope with rice, he got a chicken tinga torta with fries. We both thought they were great. 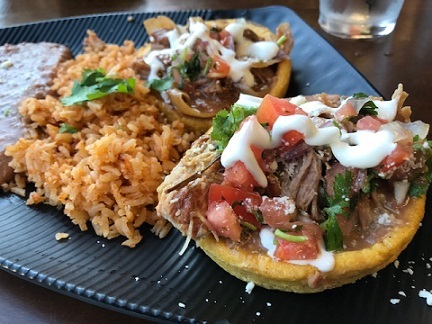 A reader had recommended the sopes, two discs of masa with a meat (or not), queso fresco, cilantro and crema, and I was not disappointed. 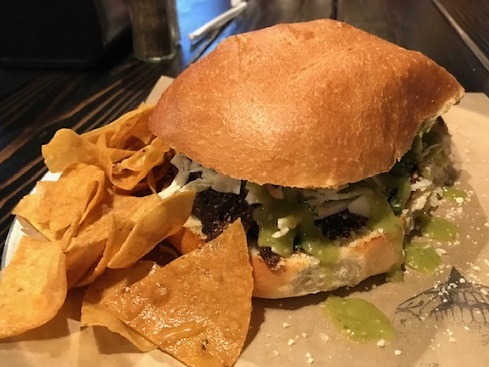 I should have asked my friend to cut his torta in half for a better photo, but I swear there was chicken inside. We both left full. Plates cost $10 to $25. 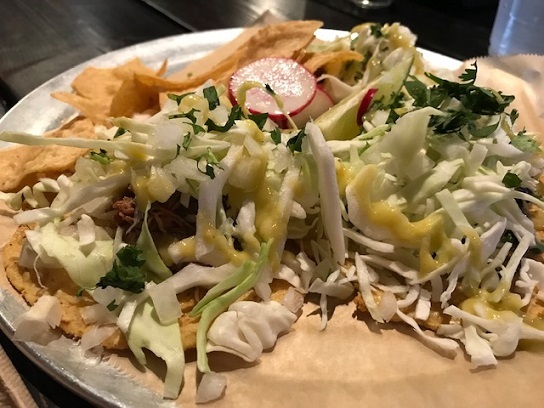 Entrees include short rib tacos, potato taquitos, chicharron tacos and a chorizo burger. Their Facebook page says they now have a vegan chile relleno. Blogger John Clifford gave a detailed account of a meal here back in June. Owner Sergio Nogueron, he said, is a Ganesha High graduate who worked in restaurants in LA before returning to his hometown. Welcome back, Sergio. You may recall this corner spot as home to Joey’s BBQ, or later The Rookery, which has moved a few storefronts west. 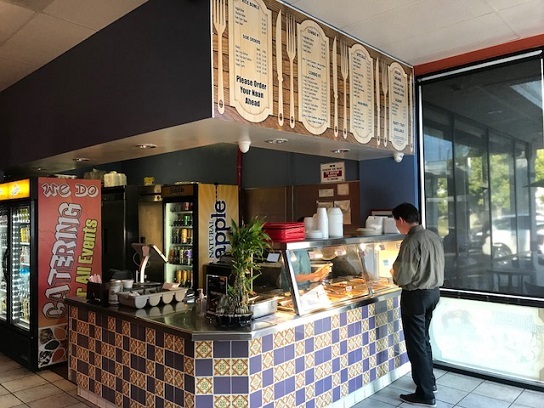 Since August it’s been home to Dia de los Puercos, a Mexican restaurant that began as a food truck and added a West Covina restaurant, as well as becoming a vendor at the LA County Fair. 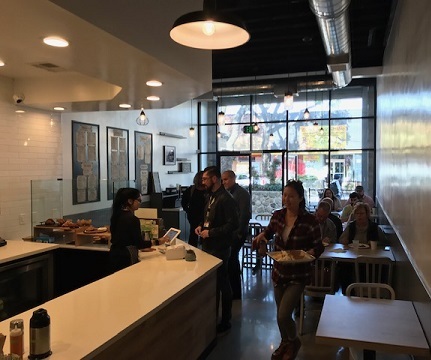 Shuttering Covina, owner Rick Garcia has now opened in Pomona and also at the new Riverside Food Lab food hall. I’d been to the Fair spot and to the Covina location, enjoying both, and was happy to see the restaurant in a permanent spot closer to home. I went in for dinner earlier this month. It was populated on a Saturday night, but low-key. It can be hard to tell if the dark-windowed restaurant is open but for the open front door. A greeter is right inside when you enter. Here’s the menu; click on the image for a readable view. For a place whose name translates as Day of the Pigs, pork is obviously a theme, but there are other meats too, as well as vegetarian and vegan options. I got the El Tri ($10), the three-taco plate, with pastor, barbacoa and huitlacoche. Underneath the cabbage were three very good tacos, and filling too, on handmade tortillas, with some fresh chips on the side. The dining room has banquettes, a bar and two original Joey’s picnic tables as well as some newer communal tables. The walls have graffiti-style art, street signs for 6th Street and Brooklyn Avenue, and a wall-length photo mural of the 6th Street bridge, all appealing for the Boyle Heights diaspora. Latin and soul oldies such as “Sideshow” and “Ring My Bell” played. The place had a mellow, friendly vibe. In addition, there’s a front dining room with a bar as well and a patio. As with Joey’s and The Rookery, the space is larger than needed, and a bit awkward, but they’re trying to make use of the entire floor plan. I went back a week later for lunch on a Sunday. There were some large groups, including extended families with men in buttoned-up flannel Pendletons. A Latina reader saw me and later shared that while I was the only Anglo in the restaurant, “you looked totally comfortable” — which I was. Anyway, I got the El Sangweesh ($7), a sorta with pork mole as my meat. The result, which I cut in half for easier eating, was flavorful and carried me through the rest of the day. Eater LA’s Bill Esparza has produced a close look at the restaurant, which he describes as “a shrine to Chicanismo, or Mexican-American street culture” and an exemplar of “pocho cuisine.” Recommended reading, and the photos are great. 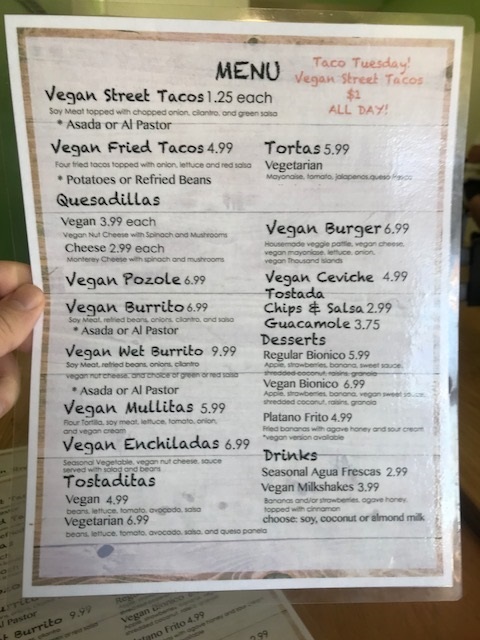 This is a rarity, a vegan restaurant, and in a smaller subset, vegan Mexican. 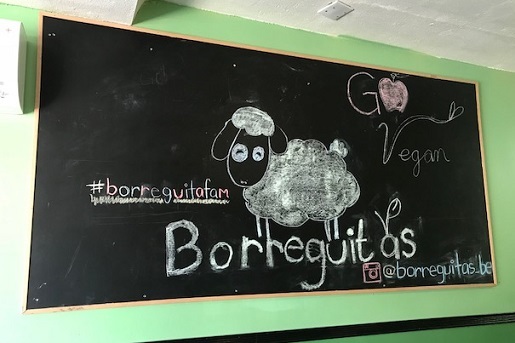 A vegan friend who lives nearby had eaten at Borreguitas several times since its July opening and invited me and two other friends to lunch. Seating about a dozen, it’s a small place, sandwiched (possibly with sprouts) between a barbershop and La Fuente, a 24-hour Mexican restaurant. The story is that there’s an ownership connection with La Fuente, where vegan items were introduced and ignored because nobody really knew about it. Borreguitas, however, seems to be a hit. In the two hours we were there, people kept cycling through or picking up to-go orders. 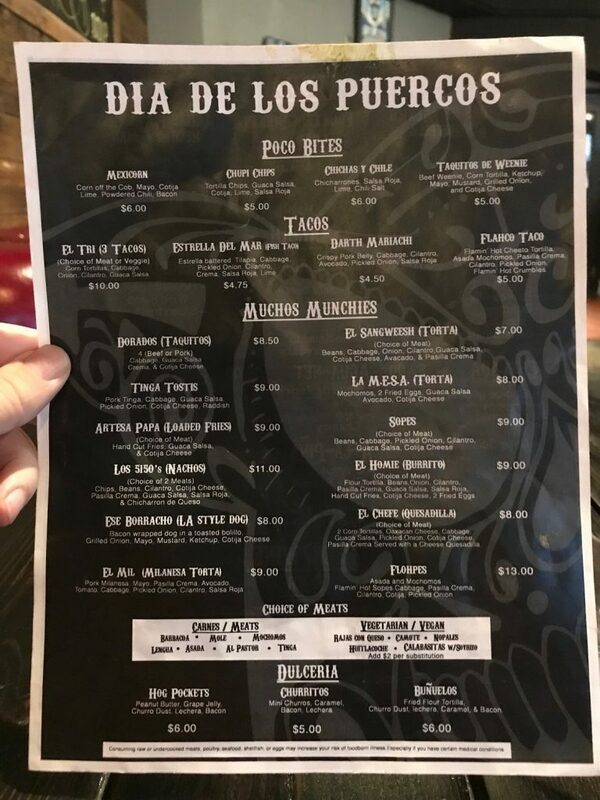 The menu has tacos, burritos, quesadillas, mulitas, enchiladas, tortas, pozole and ceviche, all Mexican staples, only with soy meat, vegan nut cheese and the like. 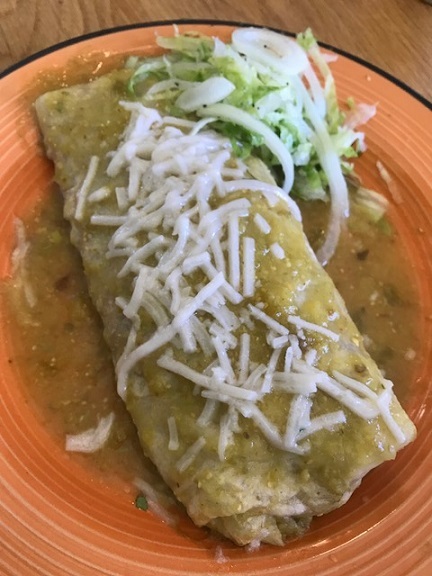 Of our group of four, three got the “asada” burrito with either red or green salsa ($10). I photographed the green. You can imagine the red, I trust. The second carnivore also liked his burrito and said, “I will gladly take my meat-loving friends here.” He had earlier joked: “My comment is, ‘Add a little meat and: delish.’ You don’t need to put that.” I didn’t need to, but I try to go above and beyond. Of course the vegan liked it. She’d had it before. 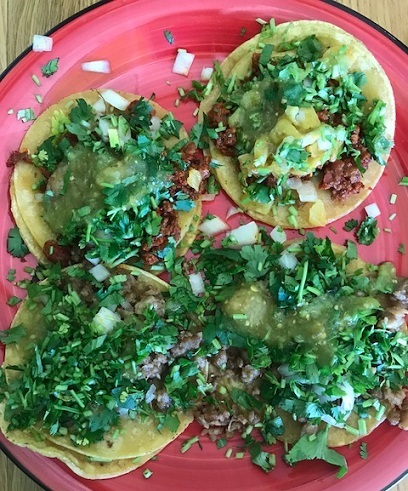 I had the street tacos, four of ’em ($1.25 each): two “asada,” two “al pastor.” They looked much like the real thing, dusted with cilantro and chopped onion, the asada looking steak-ish, the al pastor ruddy, with (a nice touch of authenticity) thin-sliced pineapple on top. Even though they were all from soy meat, there was no question which was which. They did taste fairly convincingly of the meats they replicated, although the mouth feel wasn’t the same. Neither was the fat content, of course. I also had one of the aguas frescas, pineapple-spinach ($3), an unusual combination but one that worked. Someone else got a horchata ($3) and liked it. I’d be open to returning, even if I prefer the real thing. 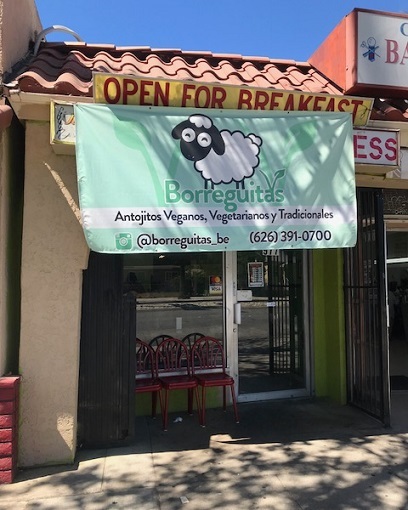 Borreguitas is definitely a welcome addition to Pomona and the rest of the valley. As I write this, Borreguitas has 61 reviews on Yelp and a five-star ranking. As you might expect, customers were mostly young, including a hipster with a lumberjack beard. But they also included families with young children. It was a nice scene, akin to something you might see in Silver Lake. By the way, Borreguitas means little lamb. “Which is adorable,” one friend remarked, “but which they don’t actually serve.” Maybe over at La Fuente. A Cal Poly Pomona friend wanted to meet for dinner and was willing to meet me closer to home. But I had thought of that little strip center near campus with three or four restaurants, none of which I had tried. The only one whose name I knew was Curry Up, a cleverly named Indian restaurant that’s been there some years. So we met there. 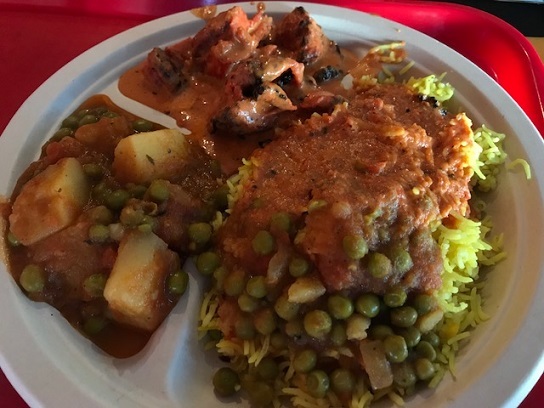 You order at the counter, with seemingly all the items already waiting on the steam table and best ordered as a two-item combo, like a modest, subcontinent version of Panda Express. 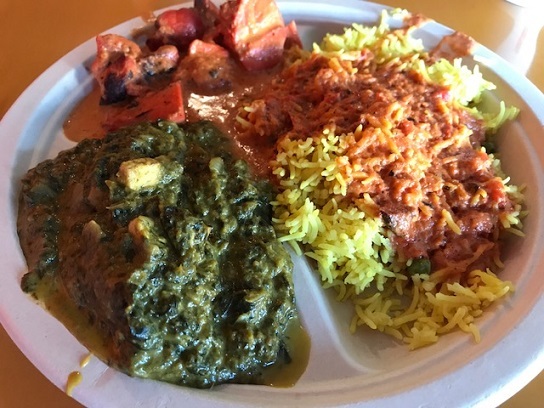 I got saag paneer and chicken tikka masala, with basmati rice, seen above. With drink and garlic naan, this came to $11.15. My friend got chicken tikka masala and allo mutter, with no drink, and paid around $8. If I remember right, the regular naan is free — does this mean the cost is naan? 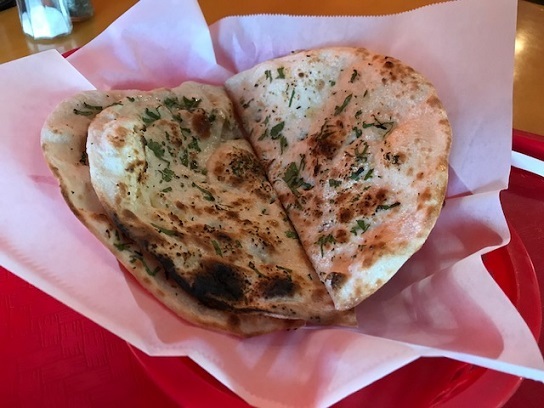 — but there’s a small charge for garlic naan, which is pretty much everybody’s favorite style of naan and which therefore is worth the extra buck or whatever it was. My friend liked his meal. Mine was all right, and the saag was spicier than expected. 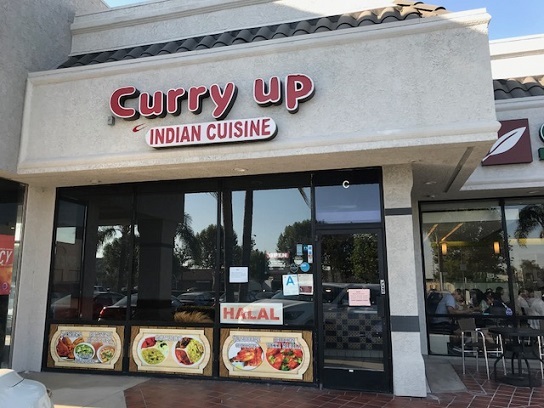 I have to be honest, Curry Up was nothing special. But I hadn’t had Indian food in a while and it was nice to have some again. And, while I’m prepared to be wrong, it might be the only Indian restaurant in Pomona. I was surprised recently to learn that I had never written a Restaurant of the Week about Angelo’s. Not that it’s such a culinary landmark, but I’ve eaten there once or twice over the years, and it’s been in business since 1983. 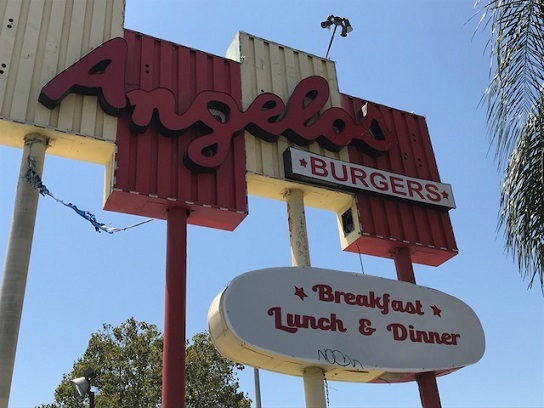 In the neighborhood recently for an interview at the police station, I stopped first at Angelo’s for lunch. 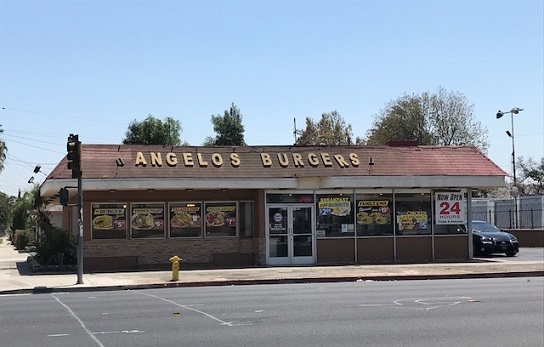 The sign would seem to predate Angelo’s, but what was it? Darin Kuna tells me the restaurant was a Taco Lita in the 1960s. There’s a drive-thru, and the pickup window is, a bit comically, on the passenger side. But that’s due to the configuration of the lot; otherwise, people would be placing their orders out on Mission Boulevard. Anyway, Angelo’s has burgers, some Mexican fare and dinner plates under $10. 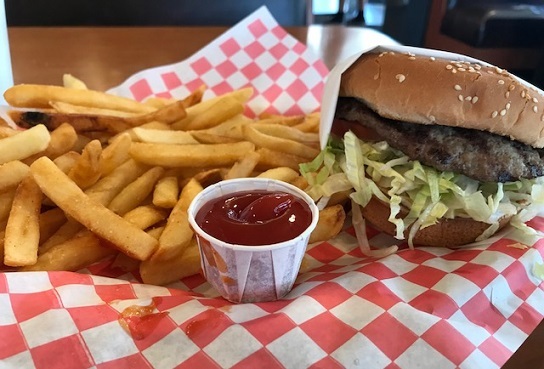 I got the burger special ($6.49): a quarter-pound hamburger with lettuce, tomato, onion and Thousand Island dressing on a sesame bun, plus fries and soda. 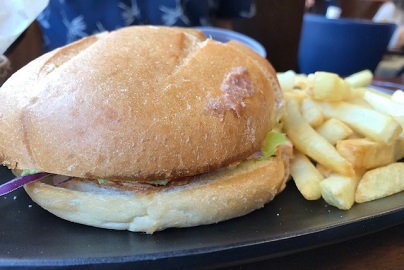 While the burger was nothing special, it was grilled and not bad at all. The fries were fat and soft, that interim size between regular and steak fries. There were probably a hundred of them, far more than I was interested in. People on Yelp recommend the pastrami burger, chili cheese fries and chicken tenders. 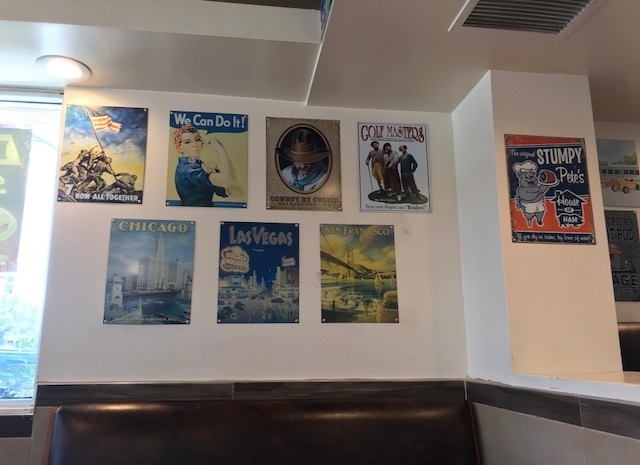 The walls and support pillars held the de rigeur old timey tin signs with vintage advertisements, propaganda posters, Marilyn images and nickel Pepsi ads, plus license plates from various states lined up and wrapping around the walls near the ceiling. The restrooms are rare local examples of pay toilets, with tokens from the counter, no doubt to deter the homeless. 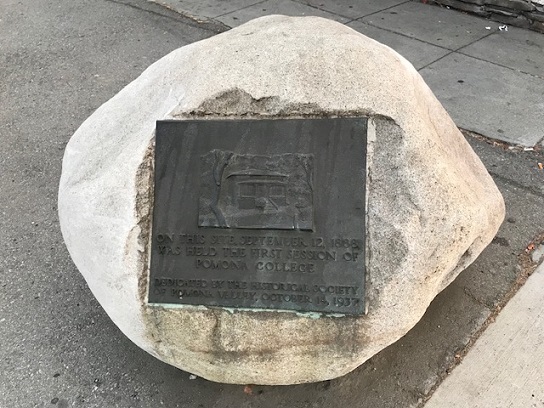 A notable feature of Angelo’s is that the site was the original 1888 home of Pomona College, as marked by a plaque on a stone at the corner. 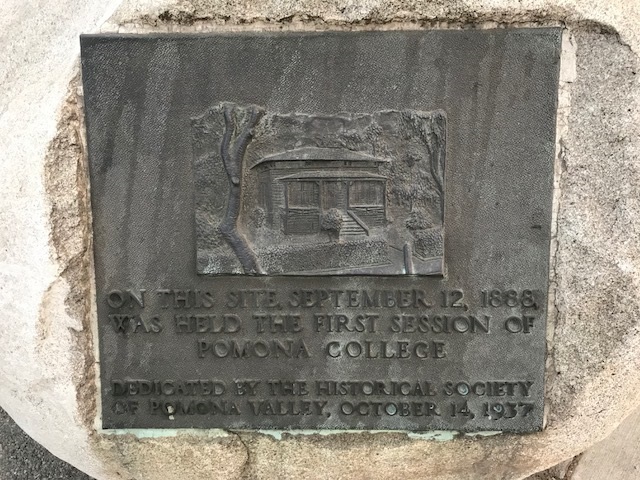 Imagine, Pomona College was once actually in Pomona. I ate at Angelo’s with the then-president of Pomona College in 2013 to mark the college’s 125th anniversary. The plaque, from 1937, is historic in its own right. Note: The college did not have a drive-thru. 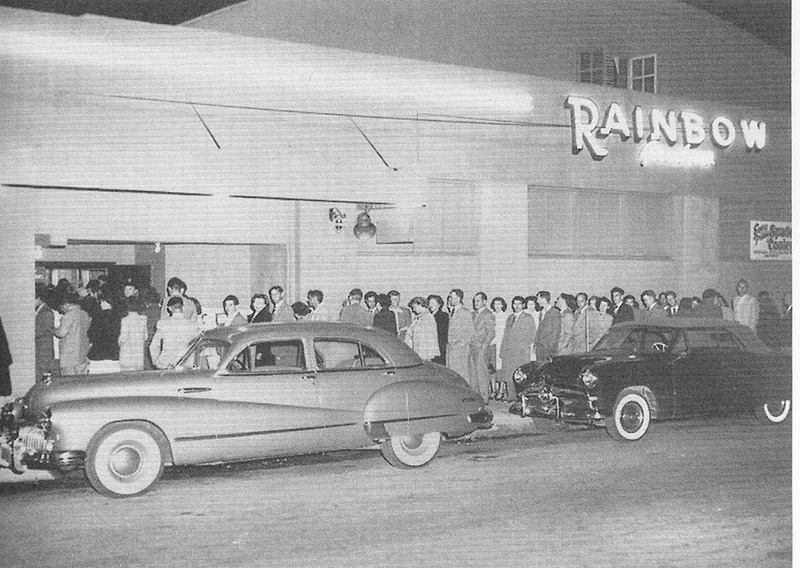 Rainbow Gardens was a popular dance hall in Pomona from the 1940s to the 1960s. 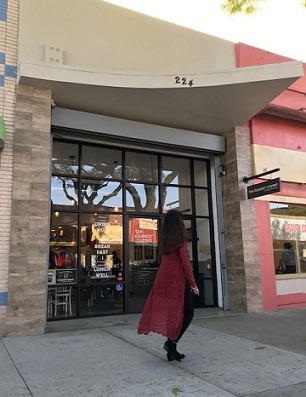 The location was 150 E. Monterey St. (at Garey Avenue), immediately south of the YMCA. An impressive number of well-known musicians performed at Rainbow Gardens. Names include western swing star Spade Cooley, crooners Frankie Laine, Perry Como and Nat “King” Cole and band leaders Harry James, Les Brown, Freddy Martin, Lawrence Welk and Count Basie. Capacity was 2,500. The Gardens is best remembered, though, for the R&B and rock bands who performed there — the club was on what was known as the Chicano circuit, which included the El Monte American Legion Stadium — and attracted large, mixed audiences, especially Latinos. KRLA hosted weekend dance parties. Acts who performed at the Gardens include Ritchie Valens, Roy Orbison, Chris Montez, Lou Rawls, Little Richard, Frankie Avalon, Tito Puente, Perez Prado, Herb Alpert, the Romancers and, before their first record came out, the Beach Boys. The Mixtures, a group from Oxnard that served as the Gardens’ house band, released an album titled “Stompin’ at the Gardens,” and Ronnie and the Pomona Casuals put out a single, “Swimming at the Rainbow.” Candelario Mendoza, a radio disc jockey and later a Pomona educator, was an emcee, booker and consultant from 1950 to about 1962. Interest in the Gardens began to wane in the early 1960s, and it burned to the ground March 25, 1965. Apparently no cause was ever determined and it was not rebuilt. To my knowledge, the lot remained empty until the Monterey Station apartments were built there almost 50 years later. Most of the above came from “Land of Thousand Dances: Chicano Rock ‘n’ Roll in Southern California,” “A World of Its Own” and the Progress-Bulletin files. I’ve been reading up on Rainbow Gardens for an eventual column or two. If you ever went there or know anything about it, please comment for posterity! 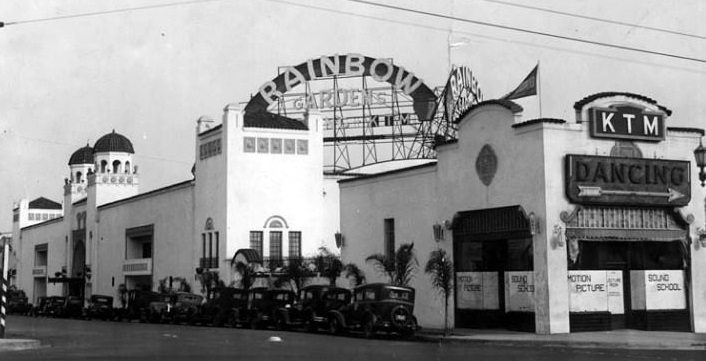 For the record, the original photo with this post, now placed below, is of a Rainbow Gardens nightclub from Los Angeles and was taken from the Inland Empire 50’s, 60’s, 70’s Facebook page. I apologize for the mistake and thank Darin Kuna, Kenny Soper and others from the Growing Up in Pomona in the ’40s, ’50s and ’60s page for the correction.